Before to asking these questions, producers must first determine the goal of their operation. Resources such as land, labor, time, and money all play a critical role in the daily management of an operation. In today’s society, there are two types of consumers. Those that want access to quality protein sources at low prices, and those that are willing to pay a premium for specialty products (i.e. grass-fed lamb). When grain prices are low, it may be more economical for producers to finish lambs on grain. 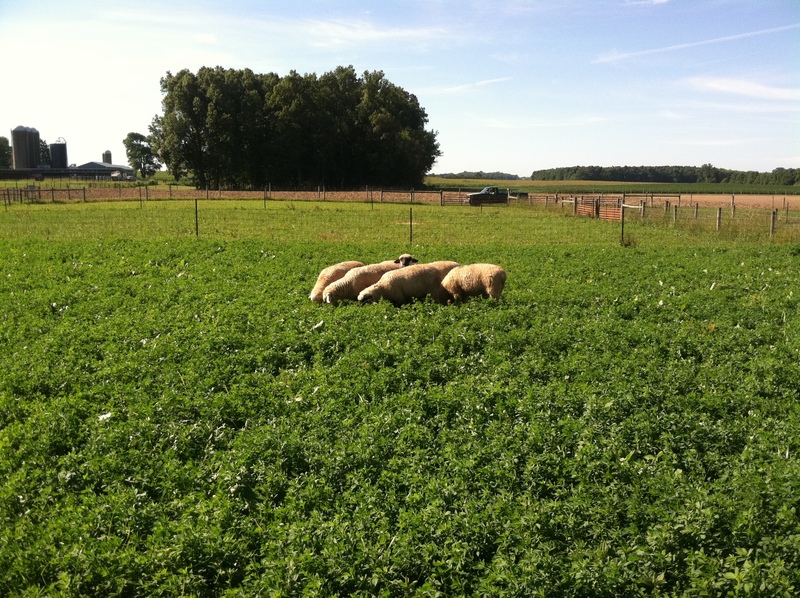 However, in order to reach a premium through specialty markets, producers may choose to finish their lambs on pasture. Regardless of which finishing strategy is chosen, producers need to understand both the performance and carcass merits achieved and lost in using each finishing system. In order to address these questions, the authors listed below conducted the following experiments. 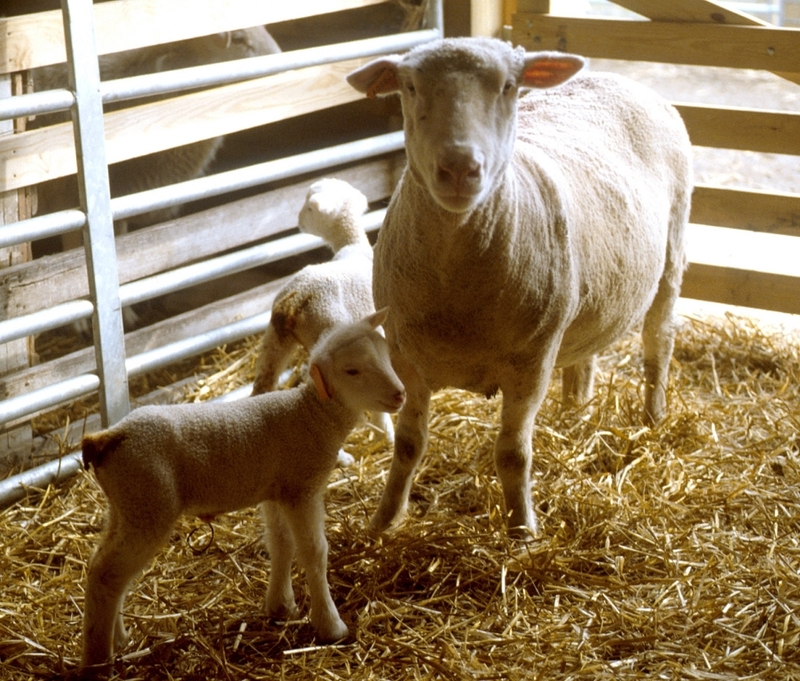 Over a 3-year period (1983 – 1985) a series of experiments were conducted in order to determine an ideal lamb finishing diet by assessing lamb performance and carcass characteristics. Each year, lambs were rotationally grazed on either orchardgrass (OG), ryegrass (RG), or alfalfa (ALF) pastures and compared to lambs fed an all-concentrate diet in a drylot (DL). All lambs were harvested when DL lambs reached a fat depth over the ribs of 0.22 – 0.28 inches as determined by manual palpation. Therefore, all lambs were harvested at the same age and number of days on feed. From a performance standpoint, DL lambs had the greatest average daily gain (ADG) and total gain, where legume fed or ALF lambs were intermediate and grass-fed (OG and RG) lambs had the lowest ADG and total gain. When comparing forage types, ALF lambs performed better than grass-fed lambs, with no differences in performance when comparing grasses (orchardgrass vs. ryegrass). This increase in performance may be attributed to an increase in forage quality. According to forage analysis, the alfalfa pastures were the highest in protein when compared to the grass pastures. However, it is noted that the grass pastures provided adequate amounts of protein to sustain lamb growth as well. When looking at carcass characteristics, grass-fed lambs had smaller carcasses as shown by less muscle, fat, and bone when compared to DL and ALF lambs. This may be a result of lambs being harvested at the same age. If lambs were fed to similar body weights, these results may differ. ALF lambs had smaller carcasses than DL lambs; however, there were no differences in muscle mass when comparing these two groups. This can be attributed to ALF lambs having less carcass fat when compared to DL lambs. In return, ALF lambs had more desirable yields (more sellable product) than compared to DL lambs that had more waste (fat that was trimmed off the carcass). In conclusion, forage-fed lambs (ALF, OG, and RG) had lower daily gains and resulted in lighter carcasses when compared to concentrate fed lambs. However, this result is mainly attributed to all lambs being harvested at the same age and number of days on feed and may differ if lambs were harvested at the same weight. From a carcass standpoint, legume-fed lambs had lighter carcasses, but had had the same muscle mass as concentrate fed lambs. Concentrate fed lambs accumulated more carcass fat when compared to all other lambs. Therefore, finishing lambs on alfalfa pastures may result in leaner lambs that are adequately muscled and produce desirable carcasses in order to maximize on lamb performance in pasture based systems. McClure, K. E., R. W. Van Keuren, and P. G. Althouse. 1994. Performance and carcass characteristics of weaned lambs either grazed on Orchardgrass, Ryegrass, or Alfalfa or fed all-concentrate diets in drylot. J. Anim. Sci. 72: 3230-3237. Posted by Braden Campbell at 8:00am January 4, 2019 Posted in Nutrition, Research and tagged Marketing, Nutrition, Research. Bookmark the permalink.